We're sharing our weekly post early because we won't be working the rest of the week. At this time of the year our creativity sometimes wanders into the kitchen. This is our own special mince-pie recipe - with a difference. Very easy and fun and, most importantly, magnificently yummy. To make dough: sift 2 cups of flour and 1 pinch of salt. Cube 120g chilled butter. Rub the butter into the sifted dry ingredients until it looks like breadcrumbs. Add 1/3 cup freshly squeezed orange juice, 1T orange zest and 2T sugar (we used brown sugar). Mix it all together (with your hands) until it's doughy. Roll it up in some plastic and pop into the fridge for half an hour. This makes it easier to roll out. Pre-heat your oven to 180 deg C. Roll out the dough onto a flat surface (use extra flour to stop it from sticking). 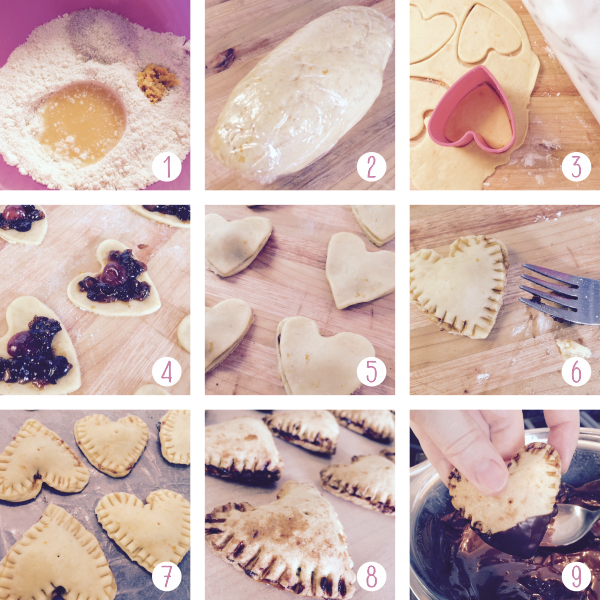 Cut out heart shapes with a biscuit cutter. 2 hearts per pillow. Fill half of the halves with half a glace cherry (the surprise) each and a blob of fruit mince. Pop the unfilled heart tops over the filled ones. Seal the edges with a fork and prick each one in the middle with a skewer stick. Place onto a baking tray (we used wax wrap to keep things tidy) and slide into the oven for 30 mins. When ready (very slightly browned on the top) take them out and allow them to cool for about 20 mins. While your tasty treats are cooling, melt some dark chocolate in a double boiler on the stove then dip the point of each pillow into the melted choc. Spread them all out onto a tray and let them cool in the fridge. Hopefully they'll still be there when you're ready to serve them. Yum.